Enter the phrase war for talent into your web search browser and watch what happens. Your screen fills with articles, studies, presentations. With unemployment at a 17-year low, the struggle to attract and retain good workers has become a constant topic of conversation in the business community. That’s because when job options are plentiful, employees can be choosy about where they want to work. That’s what makes the key finding in the 2018 State of Employee Communication and Engagement report so timely and head-scratching. The study of 1,072 U.S. workers, conducted for Dynamic Signal, found that half of American workers are completely stressed out by the explosion of communication systems they use on the job. But here’s the really provocative part – 33 percent are so frustrated that they have even considered quitting their jobs. Pause on that finding for a moment. One out of every three employees has contemplated jumping ship. And that’s all because the communication efforts at their organizations are so muddled. They’re fed up with feeling less informed and more confused. Again, this is happening at a time when businesses already are fighting to find and keep talent. It’s almost as if companies are trying to shove good employees toward the exits. The second consequence is that companies are just less productive. Kaufman cited Gartner’s CEB Internal Communications Council research of more than 3,000 companies that discovered well-informed workers are 77 percent more likely to be high-performing employees. “With people being the largest expense of any organization, it’s unacceptable to undermine their ability to succeed through poor, disjointed and hard-to-access communication,” she added in her interview with CMSWire.com. Most organizations understand that employee communication is the foundation of a strong company culture. But the technologies they’re using to improve the connection with employees aren’t helping. Actually, they’re making things worse. One segment of the workforce is being overwhelmed by a ceaseless assault of pings, chats and other assorted, mind-numbing notifications. These knowledge-based employees are constantly being interrupted, which makes it difficult for them to get anything accomplished. Then there’s another portion of the workforce that doesn’t sit in front of laptops every day. For employees such as factory workers, delivery drivers, hospital staff and store clerks, the problem is getting too little information. They’re left out of the loop. Ignored. The financial implications can be severe when employees don’t have what they need at their fingertips. The typical U.S. worker is wasting between $3,175 and $6,371 in annual salary, based on the median wage calculated by the Bureau of Labor Statistics. In other words, the cumulative toll for businesses is in the billions. Yet there appears to be a stark disconnect among senior-level executives about the state of communication at their organizations. 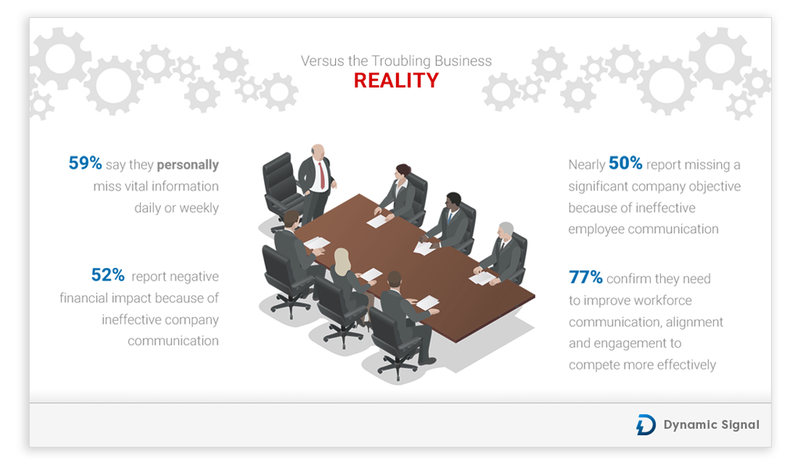 The report also surveyed 108 business leaders, and 81 percent said they are confident that at least 80 percent of their employees are aligned thanks to clear communication. Yet 52 percent also said that ineffective communication has caused them to miss vital information. If organizations don’t take that approach, the war for talent will become a losing battle. To learn more, download the full 2018 State of Employee Communication and Engagement report. Mark Emmons is the storyteller at Dynamic Signal. He previously was a newspaper reporter at the Detroit Free Press, the Orange County Register and the San Jose Mercury News. He reluctantly uses the Oxford comma.